One of the best things to come from the worldwide indoor smoking ban is the growth of the patio heater industry. Many of the bars and restaurants you find downtown now feature outdoor areas which are toasty all year round – wouldn’t it be nice to recreate that in your own backyard? As evening temperatures drop, tabletop patio heaters are an excellent option for keeping yourself and your guests warm. There’s no longer any need to restrict backyard entertaining to the summer season. A patio heater can keep you warm during cooler months, whether it’s with friends or just you, a book, and a glass of wine. The best tabletop patio heater will offer an excellent alternative to fire pits as a way of heating your outdoor area, are easier to manage and control, give more directed heat and present a far lower chance of accidents, of someone or something getting burned. In this buying guide, we will look at some of the best tabletop patio heaters for keeping you and your family warm in the comfort of your own patio, take a look at what features and specs to look for ,what to avoid and end with a detailed look at some of the top models on the market today. 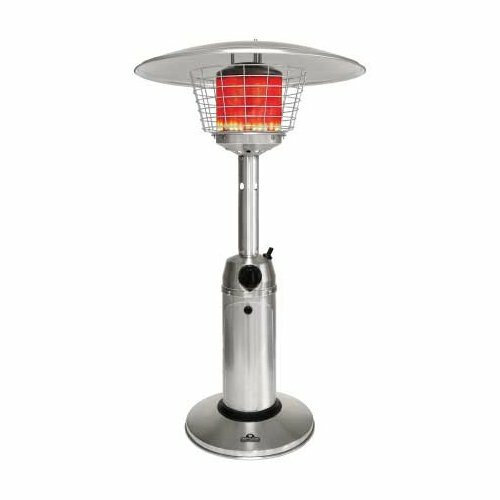 What is a Tabletop Patio Heater? What Makes a Good Tabletop Heater? When looking for extra warmth on your patio, a tabletop patio heater can be one of the best sources of localized heat. As the name suggests, they are designed to sit on a table, or similar surface and can be ideal for yards with limited space. Depending on your choice of propane gas or electric power, a patio heater will offer warmth through convection or radiation. Convection heaters, using propane, will heat up the air surrounding the device for warmth. Electric patio heaters will use infrared radiation to directly heat either objects or people within the operating radius of the device. Not many people have a backyard space that matches the spacious restaurant gardens where free-standing patio heaters are used. The main advantage of tabletop units is their compact size. You could even put one in the trunk of a car for your next camping trip, to replace a campfire. As you sit closer to a tabletop patio heater, you’ll feel the heat faster. Heating a smaller space also means they’re more energy efficient compared to a full-sized model. Being designed to sit on a table top, they offer a 360-degree heat for everyone around the table. Tabletop patio heaters are easy to move to different locations, and lightweight due to the smaller propane tanks used. By comparison, a traditional full-sized model would take up significantly more space in your garden. Once placed, due to the weight, it will take two people to move it, especially if it has a 20-pound propane tank attached or inside it. The main drawback of the tabletop heater is the limited space they heat, because of their small-scale size. They have smaller burners and offer a much lower BTU output than the 40,000 BTUs of full-sized patio heaters. A BTU (British Thermal Unit) is the amount of heat need to raise a pound of water by one degree Fahrenheit—the less BTUs you have, the less heat. You may want to invest in more than one tabletop heater for larger groups, assuming you have the room. And there lies a problem. Although they save space in your garden, these heaters will take up valuable table space. It’s a catch-22 situation. Having decided to purchase a tabletop patio heater, the next big decision is the type of fuel – propane powered or electric heater? Which one heats a wider area and lasts longer? Which is more energy efficient and more environmentally friendly? And, perhaps most important, which one costs the least? Propane gas heaters offer more freedom in the places you can use them, with no need for an extra cable or power outlet. Many will use 1-pound propane cylinders, which are stored inside the unit without additional hoses. However, they can run out quickly, and costs will soon mount up. Propane will generally give a better heat, with a wider coverage than electric or infrared tabletop heaters. Although, electric models give a more direct heat, like that of the sunlight—make sure you don’t get too close for too long, they can burn. For the eco-conscious, the efficiency of infrared creates fewer emissions than heat generated by propane and is even safe for indoor use. The heat output of a tabletop patio heater is typically expressed in terms of BTUs for propane heaters, or kWh for electric heaters. Smaller propane tabletop heaters will feature between 3,000 and 12,000 BTU output, which should be enough for 4-5 people seated around a table. The height of the propane burner, and whether it has a reflector or a mushroom design, can also affect how much heat you feel. Electric radiation heaters will be measured like electric fires in homes—with the kWh per element or light emitted. A BTU of 10,000 translates to roughly 2.9kWh, and most electric table top patio heaters only have an average of 1500 watt heaters. That doesn’t mean a gas patio heater provides twice as much heat, it just means more energy is used. Before choosing a tabletop patio heater, consider the size of the area you’ll be making use of it. Is your patio small or large? Is it going to be situated in a covered outdoor area or in the open yard? How big is the table? Most manufacturers will specify an area the heater can reach; ensure it’s large enough for your dining area. Most tabletop heaters are designed to kick out heat in a full 360-degree direction, but an oscillating feature can help spread the heat further. Tabletop patio heaters are, by their very nature, more portable and easy to move around your patio. They can weigh less than 20 pounds, even with the one-pound propane tank inside. 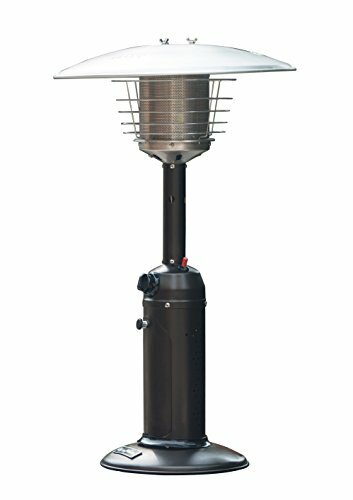 If you intend to take a tabletop patio heater on the road with you, ensure it can be easily dismantled, or the height can be adjusted for storage. There are smaller electrical heaters which offer a more compact package and are ideal for road trips. Whenever there’s high heat and fire, there’s potential for accidents. Many patio heaters come with certain safety features to lower the risks, so let’s take a look at the safety features manufacturers tend to include. When choosing a free-standing tabletop patio heater it is important that it has a shut-off valve that will cut power if it’s tilted. Most tabletop heaters will have some form of weighted base for stability, but accidents can still happen. Another safety feature to look for on gas models is a safety valve which turns off the gas if it should fail to ignite, or if the flame goes out. If it’s an electric tabletop heater, ensure the cable is going to be long enough to allow it to be securely hidden away. Many propane heaters allow for an additional hose to be fitted for connection to a larger propane tank, just ensure the base will be stable enough for a longer hose. In a period of six years, accidents relating to outdoor patio heaters or fire pits trebled. Extra guards around the propane burner or infrared heating elements can prevent hands from getting too close. Finally, ensure the base of the patio heater is designed in such a way it doesn’t get too hot; you don’t want it scorching the surface of your table. Some tabletop heaters, especially the less expensive models, may use cheaper materials which could lead to this happening. One of the most alluring features of an outdoor patio heater, tabletop or freestanding, is the ambient light it creates. It may not be enough to read a book by, but with it being so close to your face, you don’t want it too bright either. The flicker of a propane burner can be quite atmospheric, with some tabletop patio heaters using a flame for decorative effects. By comparison, some infrared heaters can be quite an intense red, which could be unsettling if too close to your eyes. When choosing a tabletop patio heater, consider the area you live in. Wetter or more humid climates will require a hardwearing material, like stainless steel, for their construction. Inland and drier climates normally suffice with steel or aluminum. Regardless of durability, it’s not advisable to leave tabletop heaters outside all year round, especially electric models. Many manufacturers will also advise disconnecting the gas source between use, to avoid leakage. If you do wish to leave the tabletop heater outside, put it on a sturdy surface and invest in a quality cover to protect it from the elements. If you choose to go for a painted model, ensure you get one with an enameled or heavy-duty coating which will last longer. Also, check whether the surface can be repainted and, if so, what type of paint is suitable. In addition to the standard retailer’s warranty, it’s important to check what is offered by the manufacturer. Those who offer a longer term will normally be more confident in the life of their product and can inspire customer trust in a brand. Most tabletop patio heaters will be sold with at least a 12-month parts and service warranty, although higher quality models may offer up to five years. Gas tabletop heaters will, in general, be cheaper than their electric equivalent, and offer better value. The connecting hose and regulator will normally be built into the heater unit and, if correctly maintained, should last many years. Electric tabletop patio heaters are more expensive due to the costly infrared bulbs or filaments they use. With prolonged use, the infrared radiation is likely to become less effective and need replacing, which can often cost nearly as much as the heater itself. Extra costs for electric tabletop patio heaters may include installing additional power sockets—more preferable to trailing extension wires over your patio, and safer too. Taking into account all the features discussed above, we have looked for some of the best tabletop patio heaters around. With propane heaters being more common, we found four models which will help keep you warm during those cooler evenings. For those with kids, or who just don’t like the idea of a gas heater outside, we’ve also looked at two of the best, in our opinion, electric tabletop patio heaters. First off we are going to look at propane-only tabletop heaters. We like propane heaters because they normally give out more heat, compared to those powered by electricity. The amount of electricity available at the mains can limit the heat output of an electric heater, which generally will be about 2 kilowatts before it trips the circuit. Sometimes you just want something functional and stylish, like those larger models you see in trendy bars. This tabletop patio heater comes from Napoleon – better known for their high-quality grills. A couple of these stainless steel tabletop heaters would look great at your next grill party – it won’t just be the food that’s hot anymore! Arriving unassembled, the first thing you notice is the durable build quality. Included in the box are all the components, including a base, burner column, and the dome, with heat emitter assembly. All the parts are made of 304-grade stainless steel that won’t rust or corrode in an outdoor setting and will allow for easier cleaning. The detailed assembly instructions make it look more difficult to screw together than it actually is. With an estimated assembly time of 15 minutes, all you need is a Phillips screwdriver and an adjustable open-end wrench to complete. 18 pounds weight (excluding tank). Optional hose and adaptor for a 20-pound propane cylinder. The battery operated push button ignition makes this a very simple to use tabletop patio heater. Although it features a pretty standard 11,000 BTUs output, the quality of the Napoleon brand is known for offering more heat. With a height of 40.5 inches, it stands taller than many other tabletop heaters. However, its mushroom design offers a 360-degree all-round heat, covering a distance of seven feet—ensuring all your guests feel the benefit. On the medium setting, the self-contained 1-pound propane tank should offer heat for three to four hours. Stylish enough for commercial use, Napoleon offers an adaptor kit and hose for linking to a 20-pound propane tank too—ideal for those parties which go on longer. Durable 304-grade stainless steel construction. Safety cage around burner prevents little hands from getting too close. An ambient glow from burner provides a subtle lighting effect. Portable and compact—ideal for camping trips or tailgates. 360-degree heat from “mushroom” design. Adjustable heat and electronic ignition. Higher end of BTU scale for a smaller tabletop patio heater. No wind guard in case of sudden gusts. Purchasing a 20-pound cylinder, adapter, and hose is an extra expense. The Napoleon tabletop patio heater is a great little heater for those impromptu outdoor gatherings. It’s so compact you could even store it in the trunk of your car for camping trips. The solid build quality you’ve come to expect from Napoleon grills ensures it will last for many years. For some people, a simple stainless steel finish equals sophistication and elegance. However, for others, it can look industrial and cold – not a look you want for a tabletop patio heater. This Fire Sense offers a choice of a hammered bronze finish in a more compact tabletop heater. All the parts you need to construct this Fire Sense heater arrive securely packed in the box. A stainless steel hood and burner attachment are provided, with a sturdy supply column and a choice of bronze or stainless steel finished base. Also included are all the nuts and bolts you’ll need, a regulator and full assembly instructions. Provided with over 20 parts, the assembly of this heater can be slightly overwhelming for the less technically minded. You’ll need a couple of adjustable opening wrenches, a pair of split joint pliers, a Phillips screwdriver, and patience, to assemble this product. With its slightly shorter height of 35 inches, it means you are closer to the heat and should feel it faster too. Controls are straightforward, with a single push button for ignition and a rotary knob to adjust output. The unit is small and lightweight, so it can easily be stored in the garage during bad weather – just ensure it’s cooled down first. Measures 13 x 21 x 35 inches tall. Heat output of 10,000 BTUs. Raises the temperature by 10 to 25 degrees Fahrenheit. Piezoelectric ignition, without a pilot light. What we particularly like is the solid weighted base for durability and stability. It’s all very well having the safety cutout features if it should tip over, but we would just prefer it didn’t in the first place. That’s not to say the heater doesn’t include safety features. As well as being stable, it has the usual auto shut off tilt valve, in addition to an oxygen depletion sensor. The reflector hood of this patio heater provides a cone of warmth around the table, for your guests to enjoy. It could make the difference between retreating indoors or staying outside as it gets cooler. 10,000 BTU—provides enough warmth for 4-5 persons. Bronze finish model is an eye-catching addition to your patio. Reflector hood will redirect heat to those seated around it. Oxygen depletion sensor is an added safety feature. Self-contained disposable propane cylinders are easy to change. Assembly can be time-consuming, with many steps to follow. No option of professional assembly offered. Burns through gas kinda quickly. The extra safety features of this tabletop patio heater may be enough to tempt you. It’s very similar to the Napoleon model, but the build quality just doesn’t seem to be as high. If you don’t want a stainless steel centerpiece on your table, maybe the bronze finish will sway your decision. If you can’t decide between the first two options, this tabletop heater from Legacy Heating offers a third alternative. One of the lower priced of the gas-powered tabletop patio heaters we’ve looked at, it comes in a stunning mocha powder coated finish. Its simple design will look great on any patio or deck area. The Legacy Heating tabletop patio heater is yet another mushroom style heater. Standing at 38 inches tall, it is among the tallest tabletops on the market. It has a stainless steel construction, with an attractive mocha powder-coated finish for extra durability. Simple to assemble, it provides all the parts you need, including a regulator, and takes about 20 minutes on average. 38 inches tall with 21-inch by 21-inch base. Stainless steel burner with an aluminum reflector. Heat output of 11,000 BTUs. Uses a 1-pound propane tank (not included). The large aluminum reflector hood makes sure all the heat reaches the areas needed most. In addition to a burner safety cage, it also features a heat-sensitive embossed warning on the hood. This glows when the burner is still hot, which is great for knowing when it’s safe to put away. A heavy weighted plate at the base adds to the stability, with an anti-tilt switch if it should fall over. A reliable control knob and button ignition mean you should be able to light the heater very quickly in most conditions. A pilot light includes a gas cut off, should it blow out. Stylish mocha powder coat finish. Weight plate adds extra stability. 38-inch height offers extra heat area radius. Portable, with the 1-pound cylinder being self-contained. Access for propane cylinder can be very tight. Aluminum reflector hood may not be as durable as the stainless steel frame. The pilot light can be tricky to ignite. When you’re looking for a more affordable tabletop patio heater, this model from Legacy Heating offers a stylish alternative. Although the 11,000 BTU burner is one of the highest in the range, just don’t expect it to heat too large an area. For some outdoor parties, an open flame can add an attractive centerpiece to the table. This tabletop patio heater differs in design, offering a stylish pyramid shape, with a flame-like effect enclosed in glass tubes. If you want both warmth and something to focus on, this tabletop glass tube heater is a tasteful addition to your table. Arriving fully assembled, styrofoam is packaged around the delicate quartz glass tubes. Just add a propane cylinder and you’re ready to go with this ultra stylish tabletop heater. Made from a stainless steel frame, a hammered bronze finish adds more elegance to the lower half of the unit. Quartz glass tubes are contained behind sturdy steel bars for a simple, yet effective look. At 39 inches high, care should be taken if you have a low patio roof. The 12-inch square base won’t take up too much space on a tabletop, but four slightly raised legs may not be sturdy enough. It’s lightweight, but the shape could make it difficult to move when lit. Portability isn’t really an issue, it’s unlikely you’ll want to risk breaking the quartz glass tubes transporting it. 39-inch pyramid design. 12 inches by 12 inches footprint. 9,500 BTUs heat output, variable control. Stainless steel finish with an access door design. Uses a 1-pound propane tank. A 5-inch adaptor hose can be connected to a 20-pound tank. It’s all about the looks with this tabletop patio heater. When at low to middle capacity, the flames will flicker halfway up the glass tube. On full heat, flames will rapidly create a fun and decorative dancing flame effect up the central column. The column provides heat to a radius of about 15 feet, and could be used at ground level for warmth, as long is it’s a safe distance from seating. On smaller tables, the pyramid design can actually take up a lot of space, although it’s tall enough to free stand too. Due to the design, more heat will go out of the top rather than radiate out of the sides. This heater does get red hot when being used and could ignite any flammables that are close to the burner. It’s advisable to allow at least 3 feet of clearance at the sides and a minimum of 2 feet of space above the heater. Provides a lot of ambience. A stunning centerpiece for any dining table. Standard size 1-pound propane tanks are elegantly hidden in the bottom section. A simple control dial to adjust the height of flames and heat output. Heat escapes through the top. Quartz glass tubes aresomewhat fragile and expensive to replace. 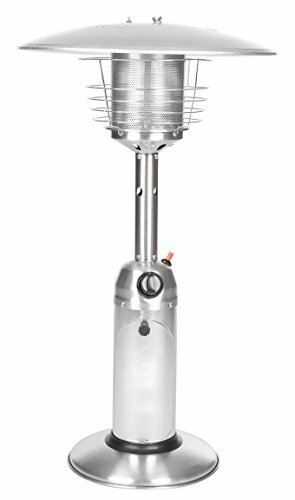 This is a simply stunning tabletop patio heater, just don’t expect too much heat from it. To have the flames up full for the maximum effect, you will burn through fuel very quickly. But if you’re looking for a balance of aesthetics and heating, no other model compares to this AZ Patio heater. If you are more eco-conscious and don’t relish the idea of burning propane in your back garden, electric tabletop patio heaters are an alternative to consider. They may initially be more expensive to purchase, but there are no running costs of propane cylinder replacements involved. For the traditionalists out there, the AZ Patio Heaters electric tabletop patio heater looks very similar to the propane model. That is until you switch it on, then you notice that vivid infrared glare, rather than the ambient glow of propane. If you are skeptical, you’ll be pleasantly surprised by the heat and light an electric heater can provide. The tabletop heater arrives well packaged and ready to assemble. Just a few screws are included, which is all that’s needed to connect three parts together – much easier than some propane heaters. An 8-foot power cord is included, for connection to a 120-volt outlet, with a simple push of the power button bringing near instant heat. At 38 inches tall, it’s about twice the size of an ordinary table lamp, but with a shape that could be easy to pick up. Made from stainless steel, it has a durable quality, but the weighted base makes it heavy, and you may not want to move it too often. However, the size is perfect for storing away when the warmer weather arrives. 38 inches tall, mushroom design, with a 22-inch diameter base. Fits 120V outlet. 96-inch power cord. Instant heat for up to 15 square feet. The light offered by this heater is more than the propane equivalent, but not too overpowering. Some people may want to place it in a corner or on the floor, for a softer, ambient mood. Being infrared, the heat won’t travel as much as propane but gives a pleasant warmth if close enough, like sitting under the sunlight. As a bonus, it’s rated to be IP55 water resistant, which will keep it safer if you have an unexpected rain shower—water and electricity don’t tend to mix well. An anti-tilt feature is similar to that found on propane models and will switch off the heat if the appliance should fall down or tip over. Simple and traditional patio heater style design. Provides quality light as well as heat. 1,500 watts of power features two heat settings. Weighted base makes it more stable and less likely to tip over. It’s heavy, so not very portable. Infrared heat doesn’t heat the air like propane, just the objects within its radius. This AZ tabletop patio heater is the ideal choice if you want a traditional looking model, but without the hassle of propane. The infrared heat provided by this smart tabletop heater will easily keep your guests warm, but in a more environmentally friendly way. Sometimes you don’t want a huge heater being the centerpiece of your table – it can often make conversation difficult with other guests. 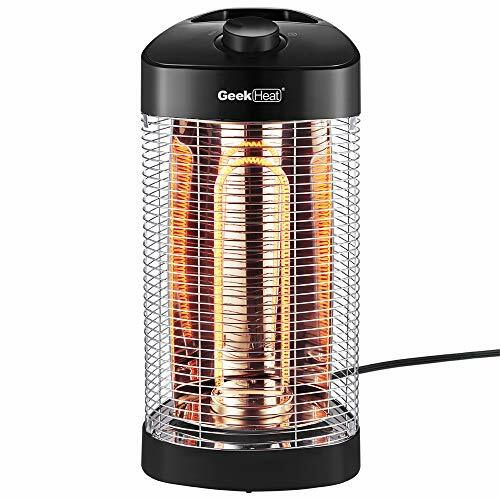 This compact tabletop patio heater from Geek Heat resembles a space heater but has been made waterproof for use outside, or even in the bathroom. The Geek Heat tabletop heater arrives fully assembled, in a compact package that only stands 21.5 inches tall. With a base diameter of just over 9 inches, it’s the sort of heater you would love to take camping with you. However it’s 120-volt electric only, so you’ll either need a hook-up on site, or take it in an RV. It’s a simple tube design, featuring infrared elements behind a sturdy aluminum cage. A handle behind the heater makes it easy to carry, or move from the floor to a tabletop. 5 inches tall with a small base of 8.5-inch x 9.3-inch. Two heat settings, 600/1200 watts with 120-degree oscillation. Carry handle makes it a very portable patio heater. Automatic shut off protection for overheat or tip over. Works with standard 120V power supply. 6-foot long power cord attached. Carbon fiber heating elements offer an instant and radiant heat. The heat tends to be more abundant and quieter than quartz tubes. With a 304-grade stainless steel reflector, the heat is amplified, for an intense warmth. A 120-degree oscillation feature provides heat in multiple directions, meaning you don’t have to be sat directly in front of the heater. Ideal for use in the middle of a table with two or three guests sat around it. With a safety IPX4 water resistance, the Geek Heat is safe for use in damp environments. An automatic shut off cuts power if the heater should overheat or get tipped over—especially useful when using indoors. Small, compact and super lightweight. Two heat settings of 600 or 1200 watts. Oscillating features provide heat in all directions. No fan noises, chemical fumes or heating odors. Metal bars remain cool even when the heater is being used. Less expensive to operate than most propane heaters. Only a small heating radius. You’ll need to sit very close. Manual states not for use in weather lower than 40 degrees Fahrenheit. The cord is relatively short at only 5.6 feet. This is an ideal heater for storing as a backup plan. As a tabletop heater, it may be ok for a romantic meal for two, just don’t expect to entertain many alfresco dinner parties with it. If you enjoy outdoor entertaining but space is limited, a tabletop patio heater can be an ideal way of keeping the party going all year round. It works for restaurants and many bars/clubs, so why not for your backyard? We’re not talking about keeping masses of people warm while they smoke cigarettes, more like just a few friends around a cozy dining table. Even just a chance for you to sip that glass of mulled wine while taking in the changing colors of the season. Critics may argue that propane isn’t too friendly for the environment and electric is better. But really the only true “green” way of keeping warm outdoors would be to put on an extra layer of clothing. If you have any feedback or questions, we’d love to hear from you in the comments below. We will always be here to answer any questions you may have.